Pique Macho, roughly translated, means man-snack. 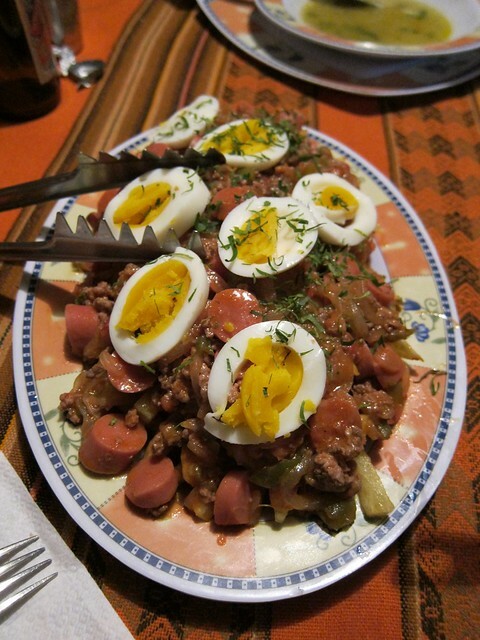 It may not look that appetizing, but Pique Macho is a classic Bolivian dish containing beef, french fries, onions, peppers, 'sausage' (i.e., hot dogs), and hard-boiled egg. I suppose it's kind of like an American casserole, which I have always thought of as a dish that just contains whatever you happen to have in the fridge. As Nick put it, it's something that you would make for an American four-year-old's dinner. But after a long and tiring day in the high-altitude desert, it hit the spot!